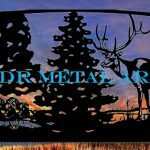 aluminum driveway gates Archives - Custom Driveway Gates - Iron Steel & Aluminum - JDR Metal Art - FREE Standard Shipping! 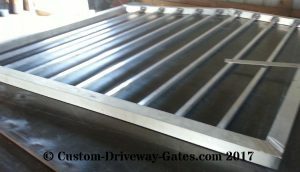 Sometime people want an extra heavy duty rust free gate so here is one with a 2x4x1/4″ aluminum rectangular tube frame. The design incorporates a whitetail deer antler theme for our client who is located in Tennessee. The antler silhouettes are plasma cut from 3/16″ thick aluminum sheets. Each gate panel has mitered seams with beveled weld joints for extra strength. We powder coated everything in a fantastic looking flat black finish after sandblasting and pretreating all the aluminum to extend the life of the coating. 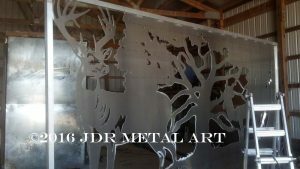 These aluminum driveway gates and side panels were designed & built by JDR Metal Art. We delivered and installed them at our customer’s home in Louisville, Kentucky home. 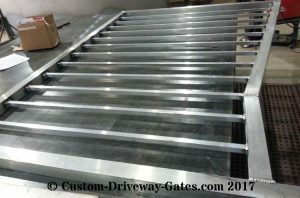 Aluminum driveway gates come in all shapes and sizes. 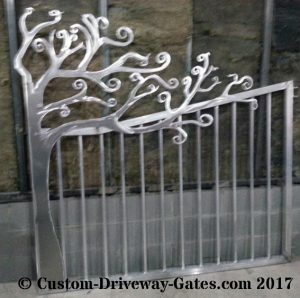 This 13 foot dual swing tree themed gate plan was modified from an idea we developed several years ago for a Tennessee customer. For this plans we added fence panels on each side complement the metal art gate panels. 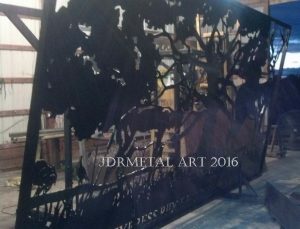 The gate panels are about 6 1/2 feet tall where the metal art trees meet in the middle. The top gate and fence rails follow a slope from 4′ tall in the center of the driveway to 6′ tall at the outside of the fence panels. These aluminum fence and gate panels utilize a 2×2″ tubing frame and 3/4″ tubing pickets. 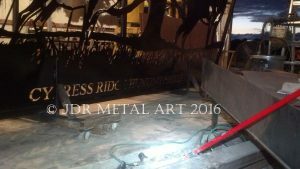 The tree cutout is made from 3/16″ thick aluminum sheet. The heavy duty hinges are roller bearing style and maintenance free. 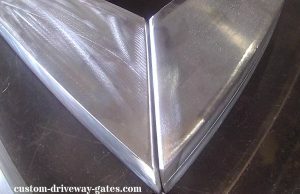 Aluminum is the perfect material for building driveway gates because it won’t rust and is amazingly lightweight for how strong it is. 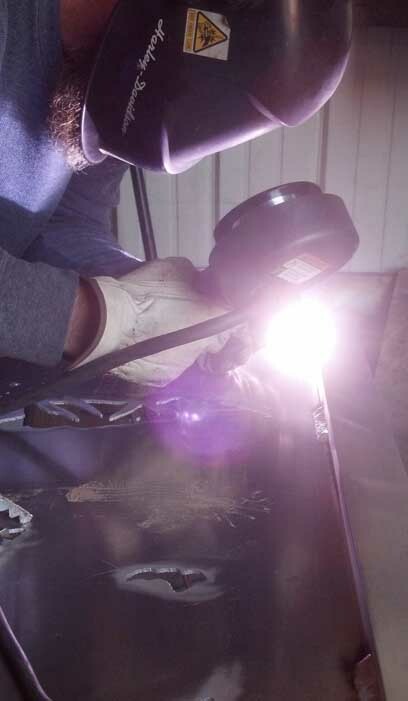 It’s somewhat difficult to weld and takes a great deal of patience and practice to master. Aluminum also must be thoroughly cleaned before it can be welded or the welds will be weak and likely to crack out. 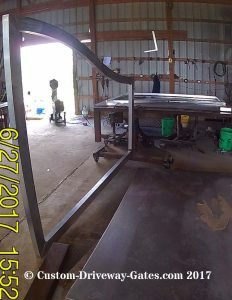 Here is a custom designed aluminum ornamental driveway gate built for a client located in Texas by JDR Metal Art. Each of the gate panels are 14′ wide, totaling 28′ in width. Aluminum is an extremely light material. Each of these gate panels weigh only about 125 lbs, roughly 1/3 of what a similarly sized steel gate would weigh. 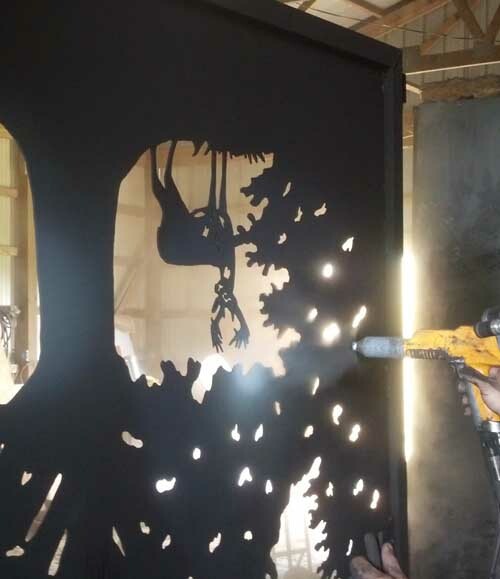 Using a plasma cutter, we hand cut all the silhouettes for these aluminum driveway gates. It leaves a nice clean cut that looks great. We apply two coats of “Super Durable” exterior grade semi-gloss powder coat finish to our aluminum gates. The first coat acts as a primer and the second coat adds another layer of protection against the elements. The powder sticks to the gate by means of an electrostatic charge. Once the whole gate is sprayed we push it into our curing oven. There it is baked at 400 degrees for 10 minutes. When the part comes out of the oven it is 100% cured. We do our powder coating in-house so we know everything is done right. We ship aluminum driveway gates nationwide. We build a wood crate on top of a shipping skid, then package the gate with blankets and foam. A lid is put over the top and everything strapped down securely to arrive in excellent condition every time. 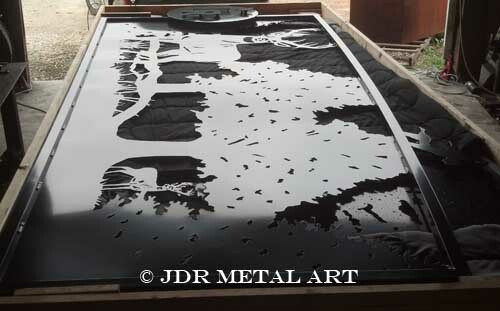 JDR Metal Art specializes in fabricating metal art driveway gates from aluminum sheet metal. 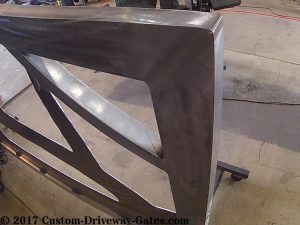 We custom design and build many other aluminum driveway gates also. There is a large demand for these gates because they are incredibly lightweight and durable. Aluminum is also much more corrosion resistant than steel. Oceanside applications are common for our gates. Contact us today to get started on your custom aluminum driveway gates! 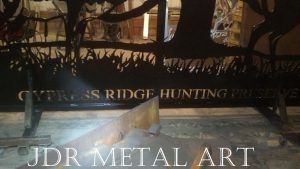 Here is an aluminum wildlife driveway gate JDR Metal Art is plasma cutting for the Cypress Ridge Hunting Preserve near Orlando, Florida. 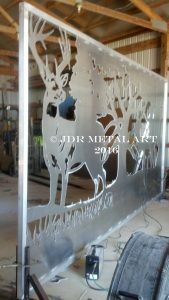 Featuring a whitetail deer, antelope and turkeys, we are building three of these single swing aluminum gates for our client. With a nationwide client base, we specialize purely in the design, fabrication and powder coating of custom driveway gates. 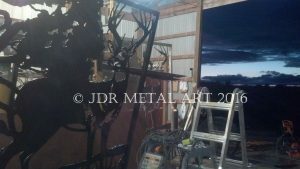 Built from extremely corrosion resistant nautical grade aluminum sheet, this is a huge single swing gate with the “canvas” measuring approximately 16′ wide by 8′ tall. Aluminum sheets this size are quite difficult to find. Typically they are used in the ship construction industry and for military grade armor plating applications. 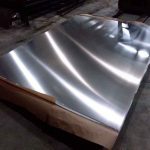 After much searching we were finally able to source three of these sheets and have them hauled from an aluminum mill in Maine to our custom gate facility in Ohio. From there we will be hauling the finished gates directly to our customer in Orlando. The gates will be offloaded there and the installation will be handled by a local installer who will be installing electric gate openers sufficient to handle these massive gates. Luckily, aluminum is much lighter than steel which means the forces of gravity and wind will be exerting less force on the gates and requiring less force to be exerted by the openers to open and close the gates. 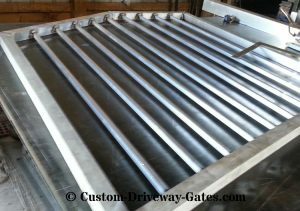 If you need a custom drive gate we are ready to get started on it for you today! 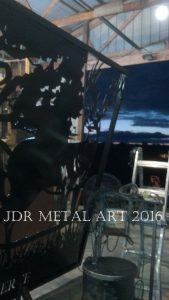 At JDR Metal Art we custom built these aluminum driveway gates for a client’s home on the Pacific coast in Oregon. They are dual swing gates which are 18′ wide total (9′ per gate panel). They were built from aluminum per the special request of our customer. 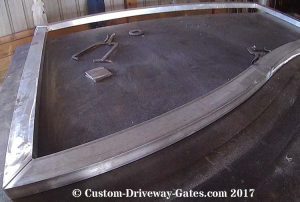 They are much lighter than our typical steel driveway gates. Each gate weighs roughly 100lbs. Here the gates are shown after we powder coated them black. 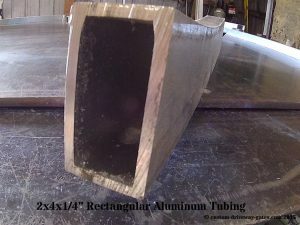 On the material specifics; we cut 1″ aluminum square tubing with a 1/8″ thick wall for the pickets. Cast aluminum finials were welded on top of the arched gate frames. 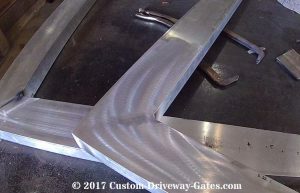 The gate frames were made with 2″ square tubing, also 1/8″wall thickness. We welded J-bolt style aluminum hinges with ball bearing and grease fittings to the 4 x 4 x 1/4 square tubing posts. 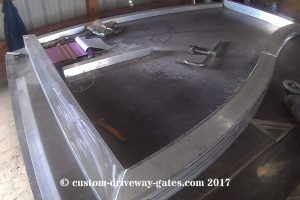 Once the gate posts are set in concrete, the J-bolts go through the gate frames and the driveway gates hang in the air. 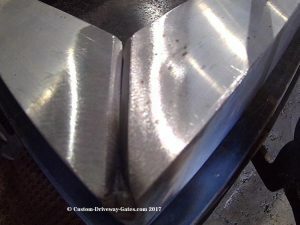 The gates are then leveled precisely by means of a nut and jam nut on each of the four J-bolts. 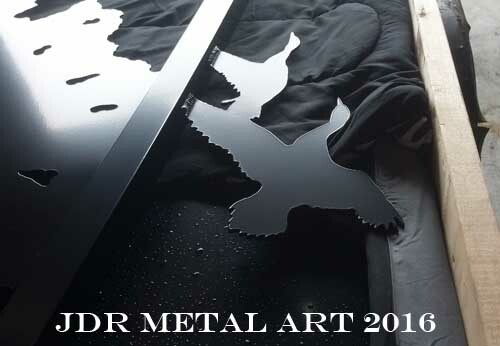 We laid out and cut these metal art elk by hand with the assistance of a Hypertherm 30 amp plasma cutter. The elk are made from 3/16″ aluminum plate. 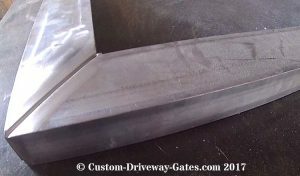 The rings were hand rolled from 3/16″ plate also and they were then welded into the gate pickets. We also burned the lettering out with a plasma torch. Our customer’s last name was welded into the pickets at the bottom of the driveway gate. We are glad to say they now have a gate unlike any other! 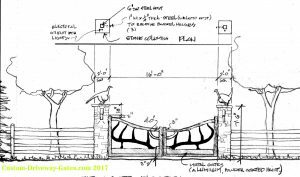 We worked with these clients from Oregon mostly via email to provide them with numerous drafts of the gate design until we were able to meet their needs for a custom gate design. It is always exciting to be creating something new for people and we were thrilled to ultimately be able to take part in bringing another driveway gate from concept to fruition. If you have any questions please do not hesitate to get in touch with us via our Contact Us webpage. We hope to be building more custom aluminum driveway gates soon!